Without Having To Worry About The Fish ! 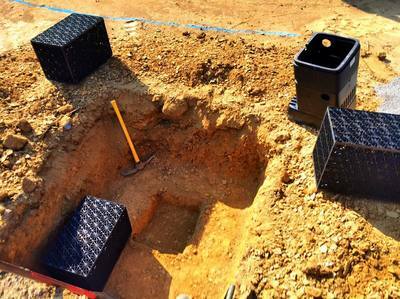 ​Are you interested in installing a water feature in your yard, but concerned about the safety and liabilities of having a pond? Or are you apprehensive about taking on the responsibility of maintaining a full-fledged ecosystem? Well, we have the answer for you. The Disappearing Pondless Waterfall is basically that — a waterfall and stream, without the pond. 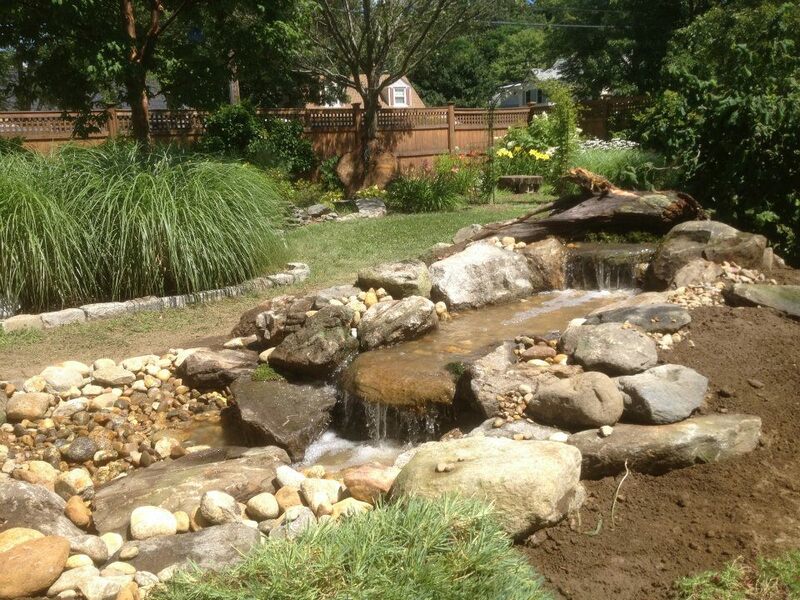 Pondless Waterfalls are simply a re-circulating Disappearing Waterfall and/or Stream without the presence of a Pond. You can enjoy the sight and sound of running water without the maintenance of a pond. 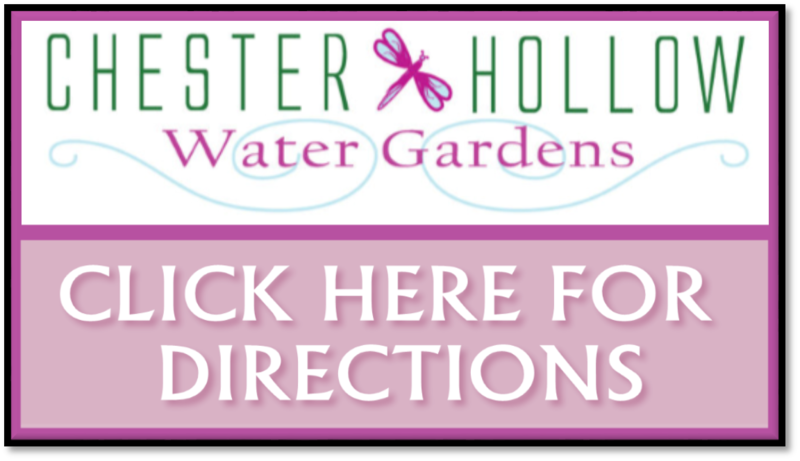 If you are considering a Pondless Waterfall for your yard, you can trust in Chester Hollow Water Gardens In Chester New Hampshire (NH) to get it done right the first time. ​Where Does The Water Go ? That's The #1 Question We Hear ! 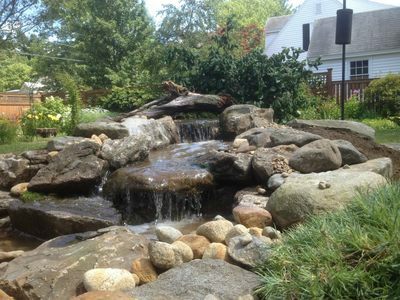 When it comes to disappearing pondless water features, they are one of the hottest trends in water gardening, and our Rockingham County New Hampshire (NH) area pondless clients ask for. 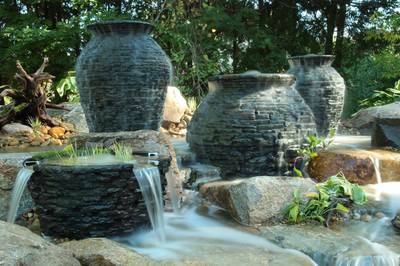 You get all the action and sound of a waterfall without the maintenance and safety concerns that come with a garden pond. Water is collected in a waterfall basin at the bottom of the waterfall. Then a submersible waterfall pump housed within a waterfall basin's waterfall well circulates the water back to the top of the waterfall. 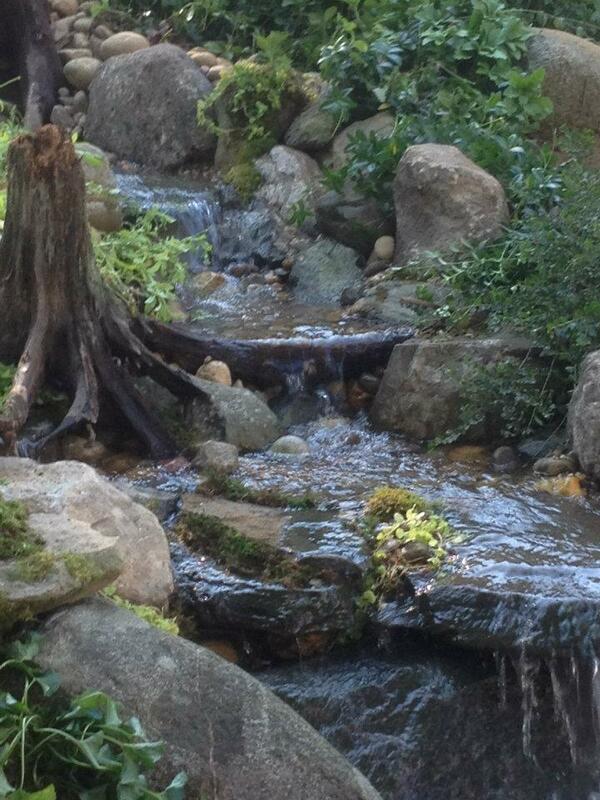 Our Passion Is Waterfalls ! 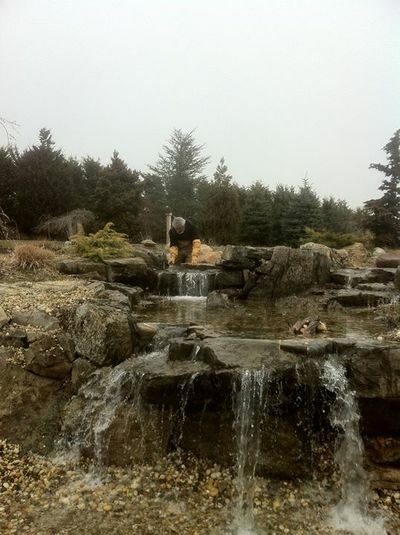 The ability to build and design almost any size waterfall allows us to create the peaceful sounds of water just about anywhere. 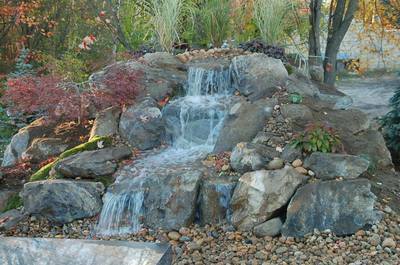 We are only limited by budgetary restraints when it comes to designs with disappearing pondless waterfalls. 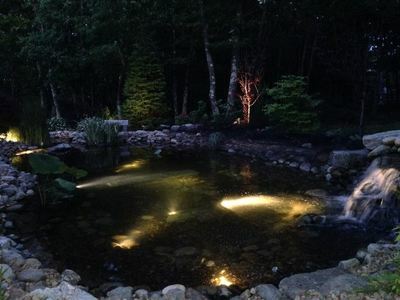 Their popularity has grown in major numbers with people who want all the "ACTION" of a pond but not the worry, or hassle of keeping fish, or having to worry about unsupervised small children falling in. ​Built Before Your Eyes ! 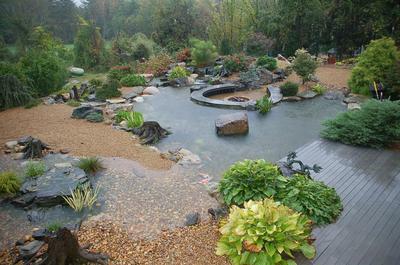 We've been in the pond business for about 20 years, and boy, what a wonderful, adventure it’s been! To think that we get to play in the dirt and move rocks around and get paid for it is crazy, but that’s what we do. 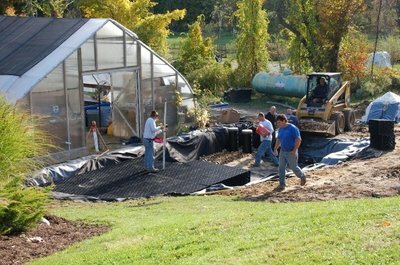 It’s pure joy, fun and excitement, and we are at our happiest when we am building ponds or now... Disappearing Pondless Waterfalls. 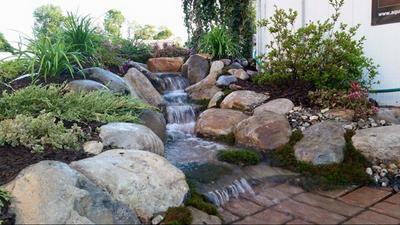 We begin with the idea that a waterfall or stream area should look as natural as possible. 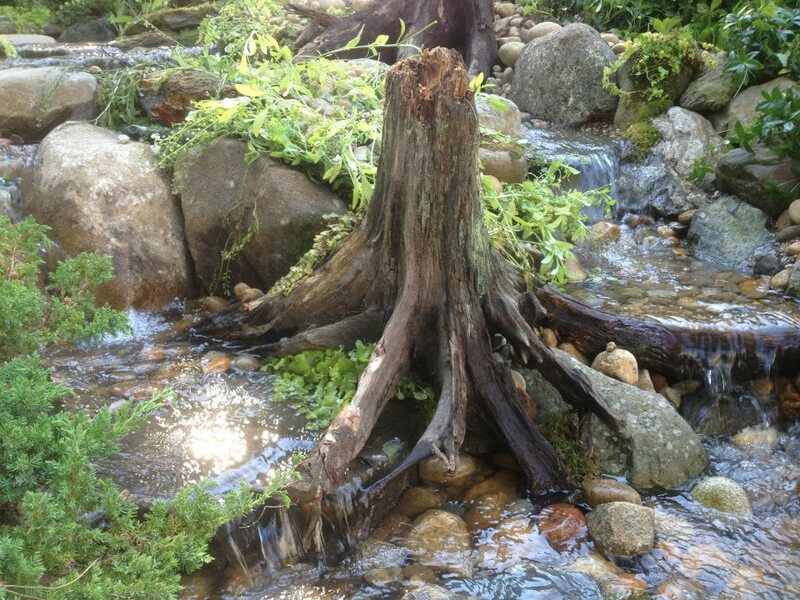 It should appear as if the stream or falls were there before the house or garden was built. “Volcano Waterfalls,” or steep berms, absolutely kill a natural appearance. Although steep berms at a waterfall can be “softened” by stone or softscape that meet the eye at a higher elevation than the start of the falls, the stream course must still be dug into and not be elevated above the surrounding landscape. Steeper waterfalls are best built into existing grade changes on your property. In our area of Southern New Hampshire (NH) there are many more chances for taller waterfalls because of the natural hills and grade changes in our region.